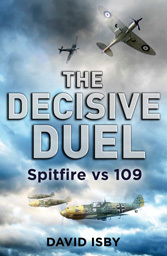 Writing my book THE DECISIVE DUEL: SPITFIRE VS. 109, a “dual biography” of the British Supermarine Spitfire and German Messerschmitt Bf 109 fighter aircraft of the Second World War, I became familiar with the surviving original Luftwaffe archival documents in the US, Britain and Germany that provide the best evidence of how the German fighter force operated. So I can tell, from personal experience, that Don Caldwell has made thorough and comprehensive use of these sources in this book. But the research that went into this book is not limited to documentary sources. The author carried out extensive interviews of German personnel – most now obviously unavailable for further comment – and has made a comprehensive use of first-person accounts. All of this demonstrates a formidable achievement in historical research. I agree with the reviewers that compare this with the late Roger Freeman’s reference works on the Eighth Air Force. Indeed, this is the most comprehensive work of its kind in English, with the only comparable German-language source being Prien’s multi-volume (and still unfinished) history of the Luftwaffe fighter force, which is expensive and rare (I hope for a revised searchable electronic edition when it is finally finished). But it will be difficult to do better than this volume.